As a crafter, I know how long it takes to make some handmade gifts. Items I receive need more than the few minutes of love I can give it, so I’m happy to post these Handmade with Love posts that showcase great handmade cards or gifts I have received. 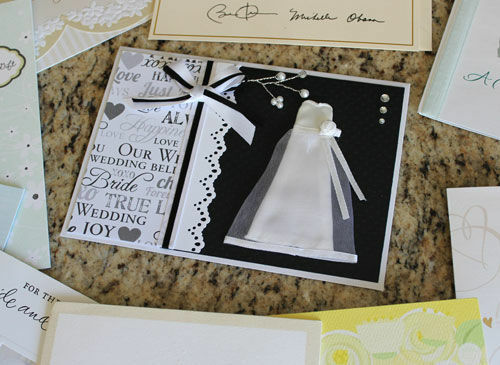 Today’s post is all about wedding related handmade items received! In September, before my big day, my girls at work (and a few of the guys too!) hosted a little bridal shower snack time with a few gifts. It was really sweet and actually caught me off guard in timing so I was surprised! 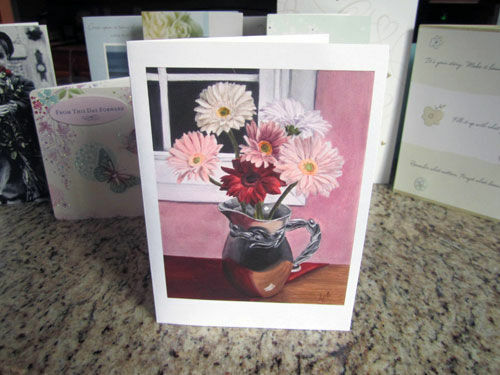 April, a local artist and now neighborly friend, created the card for the occassion, which was a print of one of her beautiful paintings! 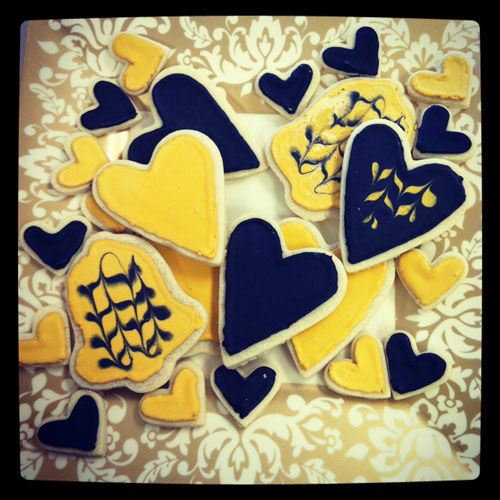 Cherylin put her baking talents to good use when creating the adorable heart and bell shaped cookies seen above! 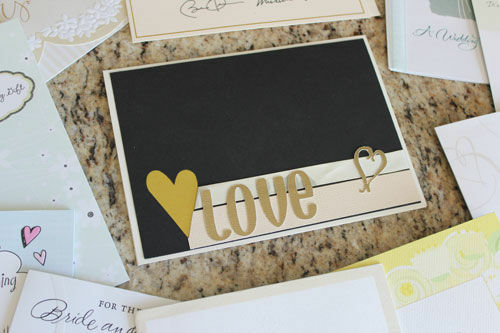 Not only were they beautiful (in my black and gold color palette!) but they also tasted delicious too!! Thanks for the sugary delights, Cherylin! 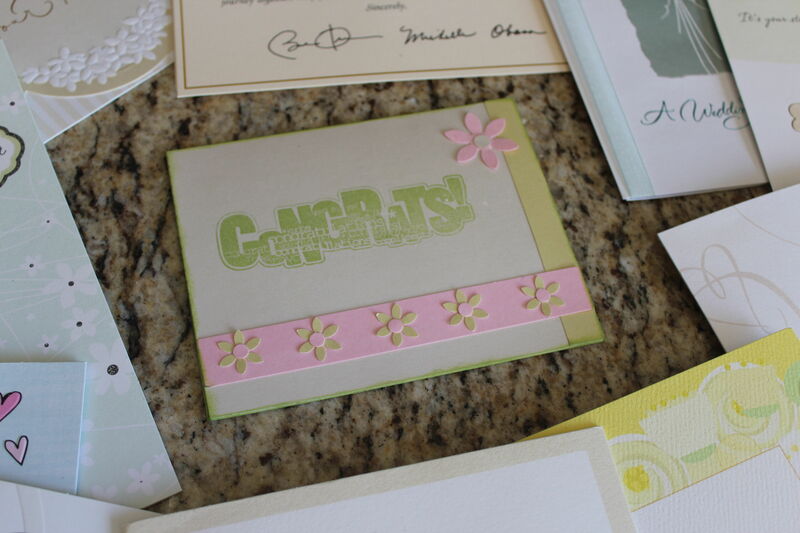 A few days before the big day, our mailbox began filling up with well wishes for those who couldn’t attend. 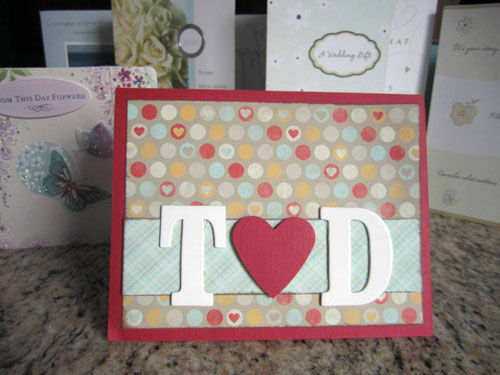 I was lucky enough to receive this adorable T (heart) D card from a very talented crafter friend and past coworker, Danielle! You know how much I love me some polka dots! D and I waited until after the wedding and after the honeymoon to sit and open all the cards and gifts generously given to us by family and friends. For me, of course, my favorite part was reading the cards and checking out all the handmade ones! The above card was made with a regular on the Handmade with Love series, my crafty friend Liz, made with a mix of stamps and layered punches! This beautiful creation was made by another crafty friend and previous coworker Anita. I love the black and white classic color palette! Avid readers know the name Allie and how important she is in my life (and a supporting cast member of this blog)! I was happy to have her stand by me as my MOH on the big day and honored to receive one of her handmade creations! The above gift was given by a family friend, Kathy, who told my mom she always makes sure to give a handmade gift from her current home state of Vermont. 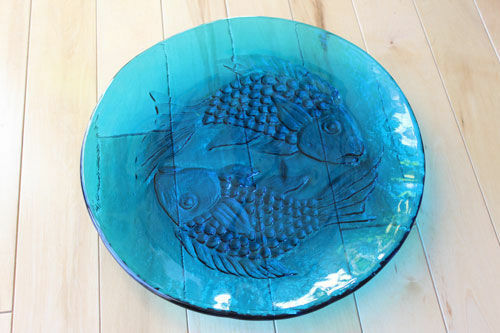 This glass fish plate is from Frog Hollow, a nonprofit organization dedicated to the exposure and appreciation of fine Vermont art and craft. It was made by Chet Color and Viiu Niiler and features what appears to be a piecies symbol, my zodiac sign!